IUET 2018: IUET stands for Integral University Entrance Test which is conducted by Integral University. IUET is an examination conducted by Integral University, located in Lucknow, which is well known for educational programs. Integral University is inviting students for Engineering Admission in Integral University and conducts an examination for new session 2018 students. Integral University is going to ready to take an examination for new session 2018. Only those candidates will take admission who get good score and rank in Integral University Entrance Exam and other candidates will not qualify for Admission in IUET. For more details like mode of selection, application form, selection process, admit card, examination pattern and much other information given below. Students want to take admission in Integral University then firstly fill the application form. Integral University Application Form 2018 is the way to enter in entrance exam which held by Integral University. 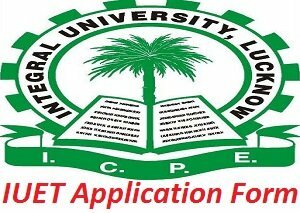 In the IUET Application Form students fill all the personal, educational, contact and all other mandatory entries. The application form is the way to students that they will be eligible for the entrance examination. Students firstly go to online and log on to the official website. Fill all the personal, educational and mandatory entries. Pay application fee and upload photo and signature of aspirants. Take a print out of future and any other use. Students can pay the amount through the mode of online like credit/debit card/ net banking and any other online process. Aspirants can pay the amount by the bank demand draft in favor of Integral University. Candidates can also pay the amount by go to Integral University Campus and pay the direct amount in cash. Students should be passed in the previous three-year diploma program. Aspirants should be passed in higher secondary or 10+2 standard with minimum 50% percentage with related subject physics, chemistry and mathematics. Candidates should be passed in examination form institute or board which located in India. Students keep nationality of Indian country and person of Indian country. Students who interested to fill application form they can refer this dates. Following are the Exam Dates IUET 2018 is given down. Students can elect branches from above-given Streams to do four-year engineering courses. 50 objective types questions for 100 marks in Physics subjects. Chemistry subject put their 50 multiples choice question for 100 marks. Mathematics subject put their 50 objective types question for 100 marks. All questions are carrying for equal marks and each question will be for 2 marks. Students go to attend entrance examination then need to use IUET Admit Card 2018. It is a key to entering the examination center. If any students do not have to admit card will not allow for the examinations. Students can download admit card from the website and keep safe. If students have Integral University Entrance Test Admit Card 2018 then they will allow for the exam and otherwise not allowed. Integral University has all prepared itself to conduct the admission test for engineering courses programs (B.E/ B. Tech). New student’s admissions will purely base on last higher secondary or 11th/ 12th class standard. If talking about admission to students university conducts examination and exam based on matric and intermediate class standard. All questions will be multiple choice and objective type. For more information related to IUET and Integral University, students can click IUET 2018 and get more details about the Integral University.